According to International Ice Hockey Federation (IIHF) and National Hockey League (NHL) rules, the only player allowed to speak with referees about rule interpretations is the captain, or, if the captain is not on the ice, an alternate captain. Although the rules do not specify any other distinction between the captain and his teammates, the captain has numerous responsibilities to the team, particularly in North American professional hockey. The captain is a dressing room leader, and also represents the players' concerns to management. The captain is often considered the primary representative of the team to the public, and sometimes is responsible for organizing the team's social functions and performing ceremonial on-ice functions, such as award presentations or ceremonial faceoffs. NHL teams need not designate the same player as captain from game to game, though most teams do. For instance, in the 1985–86, when Boston Bruins captain Terry O'Reilly retired, Ray Bourque and Rick Middleton were named as co-captains of the team. Middleton wore the "C" during home games and Bourque for road games during the season's first half, and the two switched for the second half. This arrangement continued until Middleton retired in 1988 and Bourque became the sole captain. Some teams name two (such as the Buffalo Sabres during the 2005–06 and 2006–07 NHL seasons) or three (such as the Vancouver Canucks during the 1990–91 season) captains for a season. Some teams rotate captains rather than keep one for an extended period of time (the Minnesota Wild rotated captaincy every one or two months until the 2009–10 season, when Mikko Koivu was named the first permanent captain since the franchise's inception). During each NHL game, however, only one player can officially be designated as captain. Captains are usually veteran players, though on occasion younger players are chosen. The selection is often seen as an important moment for a team, and one that can affect the team's (and newly appointed captain's) performance. Captains are selected by different means: in some instances, teams have held votes among their players to choose a team captain, while on other occasions, the choice was made by team management. Captains are often chosen due to their seniority in the game and years of service with their current club. However, franchise players—current or emerging stars—have also been named captains. Though not required, many captains have previously served as alternate captains of their team. Some selections or removals of NHL captaincies have been controversial, more so than the other North American professional sports leagues. For instance, in Canada men's national ice hockey team, then-General Manager Bobby Clarke selected Eric Lindros for the 1998 Winter Olympics, considered somewhat controversial as Lindros was chosen over longer-tenured NHL captains such as Steve Yzerman, Ray Bourque and Wayne Gretzky, Clarke was also general manager of the Philadelphia Flyers whom Lindros played for professionally. In 2000, when the relationship between Clarke and Lindros deteriorated during contentious contract negotiations and the team's handling of Lindros' injuries, the team captaincy was issued to Eric Desjardins. Tampa Bay Lightning head coach John Tortorella stripped the captaincy from Vincent Lecavalier for failing to meet on-ice performance expectations. In 1980, Darryl Sittler angrily resigned the captaincy by cutting off the "C" from his jersey with scissors, in protest of Harold Ballard's trade of his best friend Lanny McDonald, Ballard would liken Sittler's actions to burning the Canadian flag. The rules of the IIHF, NHL and Hockey Canada do not permit goaltenders to be designated as on-ice captains, due to the logistical challenge of having the goaltender relay rules discussions between referees and coaches and then return to the crease. The NHL introduced a rule prohibiting the goaltender from being a captain following the 1947–48 season (see § Goaltender captains below). In the NCAA, there is no position-based restriction on the team captain. Teams may designate alternate captains, also often erroneously called "assistant captains". Alternate captains wear the letter "A" on their jerseys in the same manner that team captains wear the "C". In the NHL, teams may appoint a captain and up to two or three alternate captains, or they may appoint three or four alternate captains and thus no captain. O A team commonly has three alternate captains when the team has not selected a captain, or when the serving captain is injured and misses a game. In the National Hockey League, it is common for three alternate captains if no one is assigned captain or the current captain is absent. International and USA amateur rules do not allow this; they stipulate that "each team must appoint a captain and not more than two alternate captains" In the Ontario Hockey League (OHL), Quebec Major Junior Hockey League (QMJHL), Western Hockey League (WHL) and minor leagues under the jurisdiction of Hockey Canada, teams are allowed to have a captain with up to three alternate captains. If the team chooses to not appoint a captain, they are not permitted to appoint a fourth alternate captain. When the captain is off the ice or unavailable for the game, any alternate captain on the ice is responsible for fulfilling the captain's official role as liaison to the referees. NHL teams may choose alternate captains from game to game or appoint regular alternate captains for the season. In North America, alternate captains perform many of the same leadership and team building roles as the captain. In the 1969–70 season, the Boston Bruins had three alternate captains (Johnny Bucyk, Phil Esposito and Ed Westfall) instead of a captain sporting the "C". However, as Bucyk was the most senior of the alternate captains, he was first one to be presented the Stanley Cup when the team won the championship in 1970 and 1972. In the NCAA, a team can designate a single alternate captain to assume the role of captain, should the captain be unavailable due to injury or penalty. The letter "C" or "A" is attached to the jersey of the team's captain and alternate captains (commonly sewn at higher levels of play, though removable insignia exist so the "C" or "A" designation can be easily changed). The designation is traditionally placed on the left side of the sweater, though the IIHF, NHL and NCAA rules specify only that it must be in a "conspicuous location on the front" of the player's sweater. Two teams in the NHL have sweaters where the positioning of the crest on the front leaves insufficient space on the left for the letter: the Detroit Red Wings, who place the letter on the right side of the home and road jerseys since the 2007–08 season, and the Arizona Coyotes, who moved their captains' patches to the right side when they updated their uniforms in 2015–16. Steve Yzerman served as the captain of the Detroit Red Wings for 20 years (1986–87 to 2005–06) and 1,303 games during that time, the longest term in the history of the NHL by both years and games. The Boston Bruins' Ray Bourque was previously the longest-tenured captain in NHL history from 1985–86 to 1999–00, being co-captain for the first three seasons. Daniel Alfredsson holds the record as the longest-serving European captain serving for 14 years (1999–00 to 2012–13) as captain of the Ottawa Senators. Brian Bellows was the youngest captain in NHL history, serving as the interim captain of the Minnesota North Stars from January 1984 until May 1984. The youngest permanent NHL captain in history is Connor McDavid, announced as Captain by the Edmonton Oilers on October 5, 2016, at the age of 19 years and 266 days. Player is still active as captain of their team. † An exact date for Brian Bellows' interim captaincy has not yet been determined. The North Stars captain, Craig Hartsburg, was injured on January 3, 1984, and Bellows became interim captain shortly thereafter in January 1984. Charlie Gardiner was the first NHL captain born in Europe to lead his team to a Stanley Cup title (1934). Derian Hatcher became the first American-born captain to win the Stanley Cup in 1999. Daniel Alfredsson was the first European-born and trained captain to lead an NHL team to the Stanley Cup Final (2007), while Nicklas Lidstrom was the first captain born and trained in Europe to lead an NHL team to a Stanley Cup title (2008), followed by Zdeno Chara (2011) and Alexander Ovechkin (2018). Mark Messier was the first NHL player to win the Stanley Cup as captain of two different teams: the Edmonton Oilers in 1990 and the New York Rangers in 1994. Sidney Crosby became the youngest captain in the NHL to win the Stanley Cup in 2009 at 21 years 10 months. 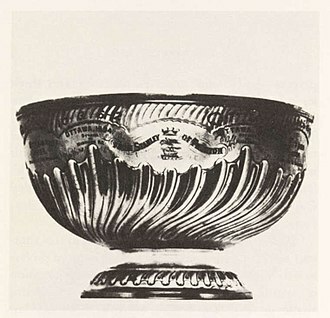 The youngest captain to lead his team to the Stanley Cup in the history of the trophy is Mike Grant of the 1895 Montreal Victorias, who was 21 years and 2 months at the time. Dirk Graham became the first NHL captain of African descent when he was named captain of the Chicago Blackhawks in March 1989. Jarome Iginla, who became captain of the Calgary Flames in 2003, has been cited by ESPN as the first black captain in NHL history. 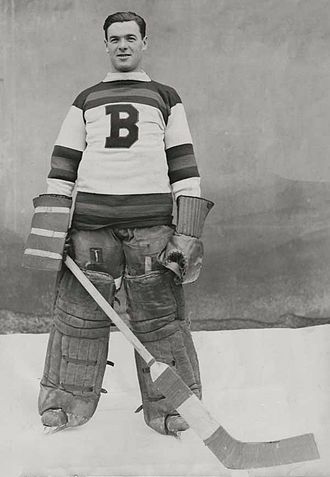 The Hockey Hall of Fame displays a picture of Toronto Maple Leafs goaltender Turk Broda wearing the captain's "C," but he never actually served in that capacity, and he was actually wearing Toronto team Captain Syl Apps' sweater. Prior to the 1948–49 season, the NHL made a change to the rules, prohibiting goaltenders from being captains or alternate captains. This was in response to complaints from opponents of the Montreal Canadiens, who complained that Durnan left his crease to argue with the referee at strategic points during games, resulting in unscheduled timeouts. This rule is sometimes referred to as the "Durnan Rule." Although the Canucks appointed goaltender Roberto Luongo as its team captain for the 2008–09 and 2009–10 seasons, since he could not be his team's official captain during games, Willie Mitchell was the on-ice captain, serving as liaison to the officials, and Henrik Sedin and Mattias Ohlund performed ceremonial aspects of the position such as pre-game faceoffs. Japanese goaltender Yutaka Fukufuji is currently designated an alternate captain of an Asia League Ice Hockey team, the Nikkō Ice Bucks. Duplacey, James (1996). Diamond, Dan (ed.). The annotated rules of hockey. Lyons & Burford. ISBN 1-55821-466-6. ^ a b "SI Flashback: Stanley Cup 1997". CNN. ^ a b c d International Ice Hockey Federation. "IIHF Rule Book" (PDF). International Ice Hockey Federation. Retrieved October 18, 2008. ^ a b c d National Hockey League (2007). "National Hockey League Official Rules". Triumph Books. Archived from the original (PDF) on September 25, 2005. Retrieved October 20, 2007. ^ a b "Daryl Sittler's longest year," Frank Orr, Toronto Star, March 16, 1980, p. C3. ^ Frank Fitzpatrick (2000). "How it all began". The Philadelphia Inquirer. Archived from the original on August 4, 2007. Retrieved July 29, 2007. ^ a b c National Collegiate Athletic Association (August 2008). 2008–10 NCAA Men's and Women's Ice Hockey Rules and Interpretations. Indianapolis, Indiana: National Collegiate Athletic Association. p. 178. ISSN 0735-9195. ^ "Rule 6 – Captain and Alternate Captains" (PDF). Archived (PDF) from the original on September 22, 2018. Retrieved September 21, 2018. ^ Ontario Hockey League (2009). "Ontario Hockey League Official Rules 2009–2010". Archived from the original (PDF) on January 4, 2010. Retrieved January 29, 2010. ^ Quebec Major Junior Hockey League (2009). "QMJHL Official Rules". Archived from the original (PDF) on February 20, 2010. Retrieved January 29, 2010. ^ Western Hockey League (2008). "Western Hockey League Official Rules 2008–2009". Archived from the original (PDF) on September 24, 2009. Retrieved January 29, 2010. ^ Hockey Canada (2008). Referee's Case Book/Rule Combination 2008–2010 (PDF). Hockey Canada. ISBN 978-1-897355-04-6. Retrieved January 29, 2010. ^ "Steve Yzerman". NHL.com. Archived from the original on April 9, 2006. Retrieved September 16, 2007. ^ "McDavid's Dedication To Craft Leads To Captaincy". NHL.com. October 5, 2016. Retrieved October 6, 2016. ^ a b "Landeskog Named Avalanche Captain". The Associated Press via Yahoo Sports. August 15, 2013. Retrieved August 20, 2013. Last September, he (Landeskog) became the youngest captain in league history at 19 years, 286 days, 11 days younger than Sidney Crosby was when he was named captain of the Pittsburgh Penguins in 2007. ^ "CROSBY BECOMES YOUNGEST CAPTAIN IN NHL HISTORY". May 31, 2007. Archived from the original on June 2, 2009. Retrieved October 1, 2008. ^ "Pittsburgh Penguins – Recap: Pittsburgh @ Carolina – 10/05/2007". October 5, 2007. Archived from the original on April 30, 2008. Retrieved October 1, 2008. 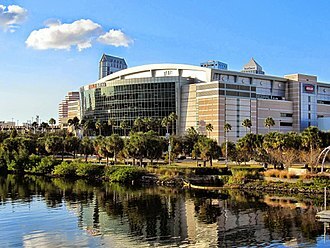 ^ "Tampa Bay Lightning History 1999–2000". Archived from the original on November 4, 2007. Retrieved October 21, 2008. ^ "NHL.com Game Summary, Game 0888, Wednesday, March 1, 2000, Washington Capitals at Tampa Bay Lightning". Retrieved April 15, 2009. ^ "Toews Named 34th Captain In Team History" (Press release). chicagoblackhawks.com. July 18, 2008. Archived from the original on September 27, 2008. Retrieved October 18, 2008. ^ Burnside, Scott (October 10, 2008). "Too young to lead the Blackhawks? Toews says: Bring it on". ESPN.com. Retrieved October 18, 2008. ^ Ziehm, Len (October 10, 2008). "5 things Hawks must do on ice to make changes count". Chicago Sun-Times. Retrieved October 18, 2008. ^ ESPN.com (October 10, 2008). "Box Score: Chicago vs. New York Rangers, October 10, 2008". ESPN.com. Retrieved October 18, 2008. ^ Detroit Free Press (2006). "Captain, My Captain". The Captain. Detroit Free Press. p. 25. ISBN 978-1-57243-935-1. Red Wings coach Jacques Demers named Steve Yzerman team captain on October 7, 1986. ^ 1986–87 Detroit Red Wings season showing their first game played on October 9, 1986 at the Quebec Nordiques and Steve Yzerman's career stats showing he played in all 80 games that season. ^ "Brian Bellows, 1982 NHL DRAFT PICK". Retrieved July 18, 2008. Became youngest team captain in Minnesota history as a 19-year-old when he filled in for injured Craig Hartsburg after Hartsburg was injured on Jan. 10, 1984. Bellows continued to wear the "C" through the end of 1983–84 season. ^ "1979 draft pick – Dirk Graham". hockeydraftcentral.com. Retrieved December 10, 2008. ^ "Iginla becomes first black captain in NHL history". Retrieved February 23, 2009. ^ TSN.CA STAFF (September 30, 2008). "CANUCKS NAME GOALTENDER LUONGO AS TEAM CAPTAIN". tsn.ca. Archived from the original on December 2, 2008. Retrieved February 23, 2009. The Montreal Canadiens' Bill Durnan was the last goaltender to serve as captain in the 1947–48 season. Prior to 1948–49, the NHL passed a rule prohibiting goalies to act as captain or assistants in what could be called the "Durnan Rule." The Canadiens keeper left his crease so much to argue calls that opponents protested saying that Durnan's actions gave the Canadiens unscheduled timeouts during strategic points in games. 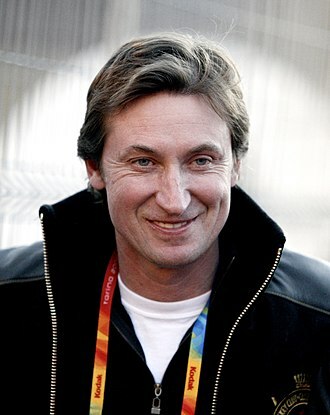 ^ "Next captain of the Canucks is Luongo". September 30, 2008. Archived from the original on October 3, 2008. Retrieved October 1, 2008. Ryan Getzlaf is a Canadian professional ice hockey centre who currently serves as captain of the Anaheim Ducks of the National Hockey League. He has played in three NHL All-Star Games and was a member of the Ducks 2007 Stanley Cup championship team, a playmaker and power forward, Getzlaf has led the Ducks in assists seven times, including a franchise record of 66 in 2008–09. As a junior, Getzlaf played four seasons with the Calgary Hitmen and was named to a Western Hockey League all-star team. Internationally, he has represented Canada on numerous occasions, Getzlaf was a member of the 2005 World Junior Championship squad considered the greatest in Canadian history, and won a silver medal at the 2008 IIHF World Championship. A two-time Olympian, Getzlaf played with Canadian teams that won medals at the 2010 and 2014 Winter Games. Getzlaf was born May 10,1985, in Regina, Saskatchewan and he is the younger son of Steve and Susan Getzlaf, and has an older brother, Chris. He attended Robert Usher Collegiate in Regina, growing up in an athletically minded family, both Ryan and Chris were encouraged to play several sports, particularly hockey and football. Chris focused on football and ultimately joined their hometown Saskatchewan Roughriders in the Canadian Football League as a slotback, Ryan played tailback in football, and represented Saskatchewan as a catcher in a national youth baseball tournament, but focused on his hockey career. While a member of the Regina Bantam AAA Rangers in 2000 and he stood 5 feet 9 inches at the time of the draft, but grew 6 inches by the time he joined the team as a 16-year-old. Getzlaf made his debut in 2001–02 and recorded 18 points in 63 games. He nearly quadrupled his production as a 17-year-old in 2002–03 by scoring 29 goals and 68 points. The Mighty Ducks returned Getzlaf to the Hitmen for the 2003–04 season and he recorded 75 points in just 49 games and was named to the WHLs first all-star team. Due to the 2004–05 NHL lockout, Getzlaf was again returned to Calgary for his season of junior hockey. He was named captain, but was briefly stripped of the title by the coaches after earning several misconduct penalties for arguing with the officials. Eric Bryan Lindros is a Canadian former professional ice hockey player. Lindros played junior hockey in the Ontario Hockey League for the Oshawa Generals prior to being chosen first overall in the 1991 NHL Entry Draft by the Quebec Nordiques. He refused to play for the Nordiques and was traded to the Philadelphia Flyers in June 1992 in exchange for a package of players. During his OHL career, Lindros led the Generals to a Memorial Cup victory in 1990, prior to being drafted in 1991, Lindros captured the Red Tilson Trophy as the Most Outstanding Player in the OHL, and was named the CHL Player of the Year. Lindros was born in London, but grew up in Toronto, Lindros began his National Hockey League career with the Flyers during the 1992–93 season. He was a power forward, and averaged more than a point per game. His hard-nosed style caused him to significant time with injuries. Lindros captured the Hart Memorial Trophy and Lester B. Pearson Award after the lockout-shortened 1994–95 season, in August 2001, Lindros joined the New York Rangers via trade. He signed with the Toronto Maple Leafs for the 2005–06 season before finishing his career in 2006–07 with the Dallas Stars, Lindros represented Canada at the World Junior Championships three times, winning gold medals in 1990 and 1991. He is Canadas all-time points leader at the World Junior Championships with 31 points, five ahead of Jordan Eberle. Lindros has represented Canadas senior team at the World Hockey Championships, in Olympic play, Lindros represented Canada three times, winning a silver medal in 1992 and gold in 2002. On October 17, Lindros was inducted into the Ontario Sports Hall of Fame where he credited the quality facilities in London, his coaches, and his parents for his success. On June 27,2016, Lindros was one of four individuals named to the 2016 Hockey Hall of Fame class, to be inducted in November. On January 27,2017, in a ceremony during the All-Star Weekend in Los Angeles, the oldest son of Carl Lindros and Bonnie Roszell-Lindros, Eric has Swedish heritage. The name Lindros means Rose of the Linden tree and his great-grandfather Axel immigrated to Canada from Bredaryd, a small village in Sweden, and Eric is the third generation of the Lindros family to be born in Canada. The Anaheim Ducks are a professional ice hockey team based in Anaheim, California. 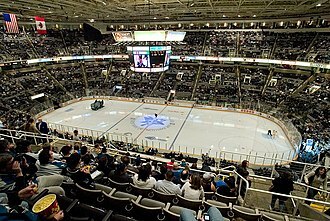 They are members of the Pacific Division of the Western Conference of the National Hockey League, since their inception, the Ducks have played their home games at the Honda Center. The club was founded in 1993 by The Walt Disney Company as the Mighty Ducks of Anaheim, a name based on the 1992 film The Mighty Ducks. Disney sold the franchise in 2005 to Henry and Susan Samueli, the Ducks have made the playoffs 12 times and won five Pacific Division titles, two Western Conference championships and one Stanley Cup. The Mighty Ducks of Anaheim were founded in 1993 by The Walt Disney Company, the franchise was awarded by the NHL in December 1992, along with the rights to a Miami team that would become the Florida Panthers. An entrance fee of $50 million was required, half of which Disney would pay directly to the Los Angeles Kings in order to share Southern California. Philadelphia-arena management specialist Tony Tavares was chosen to be president, and Jack Ferreira. The Ducks selected Ron Wilson to be the first coach in team history, the Ducks and the expansion Florida Panthers team filled out their rosters in the 1993 NHL Expansion Draft and the 1993 NHL Entry Draft. In the former, a focus on defense led to goaltenders Guy Hebert and Glenn Healy being the first picks, followed by Alexei Kasatonov and Steven King. In the latter, the Ducks selected as the fourth overall pick Paul Kariya, the resulting roster had the lowest payroll of the NHL, with only $7.9 million. Led by captain Troy Loney, the Ducks finished the season 33–46–5, a number of wins for an expansion team. The Ducks sold out 27 of 41 home games, including the last 25, Ducks licensed merchandise shot to number one in sales among NHL clubs, helped by their presence in Disneys theme parks and Disney Stores. The lockout-shortened 1994–95 NHL season saw the debut of Paul Kariya, the Ducks had another respectable season, going 16–27–5. 1995–96 would mark a big change for the team, especially for second-year superstar Paul Kariya, during the season, he was chosen to play for the Western Conference in the 1996 NHL All-Star Game as the lone Ducks representative. Raymond Jean Ray Bourque is a Canadian former professional ice hockey player. He currently holds records for most career goals, Bourque is an Olympian and has become near-synonymous with the Boston Bruins franchise, for which he played 21 seasons and became its longest-serving captain. Bourque finished his career with the Colorado Avalanche, with whom he won his only Stanley Cup in his final NHL game, Bourque was born in Saint-Laurent, Quebec. Bourque was the pick of the Trois-Rivières Draveurs of the Quebec Major Junior Hockey League. Half-way through his season, coach and GM Michel Bergeron traded Bourque to Sorel for high-scoring Benoit Gosselin. Boston GM Harry Sinden intended to select defenceman Keith Brown, the Bruins settled on Bourque, allegedly against their better judgment. Bourque would make an impact in Boston during his rookie season of 1979–80. His 65 points that season was a record at the time for a rookie defenceman, upon Middletons retirement in 1988, Bourque became the teams sole captain, and retained the position for the remainder of his Bruins tenure. The Bruins reliance on Bourques on-ice mastery was so total that—while Bourque was very durable throughout much of his team was seen by many to flounder whenever he was out of the lineup. In the playoffs, Bourque led the team to the Stanley Cup Final against the Edmonton Oilers in both 1988 and 1990, where the Bruins lost in both series. Bourque was popular among Bruins fans because of his willingness to re-sign with Boston without any acrimonious or lengthy negotiations, Bourques jersey number,77, is retired by both the Bruins and the Avalanche in honor of his contributions to both teams. However, it was not his original number, when he debuted with the Bruins, he was assigned sweater number 7. This particular number had a significant amount of history behind it for the Bruins, Bourque was the third player issued the number following Espositos departure from the team in 1976, following Sean Shanahan and Bill Bennett. Unbeknownst to those in attendance the night of the ceremony, Bourque had a surprise in store for everyone, when the team took to the ice for the presentation, Bourque skated over to Esposito and removed his #7 jersey. The Minnesota Wild are a professional ice hockey team based in St. Paul, Minnesota. They are members of the Central Division of the Western Conference of the National Hockey League, the Wild are the only one of the Minneapolis-St. Paul areas major professional sports league franchises to play in St. Paul, the other three play in Minneapolis. The new team was founded on June 25,1997, the Wild were the first NHL franchise in Minnesota since the Minnesota North Stars moved to Dallas in 1993. They lost their first game, 3–1, to the Mighty Ducks of Anaheim, the Wild play at the Xcel Energy Center. In the 2002–03 season, the team made its first Stanley Cup playoff appearance, as of 2015, the Wild have averaged a.537 points percentage since entering the league. Following the departure of the Minnesota North Stars after the 1993 season, mayor Norm Coleman began a campaign to either recruit the relocation of an existing franchise to St. Paul or the award of an expansion franchise to a Minnesota-based ownership group. Shortly after the attempt to relocate the Jets, the NHL announced its intention to expand from 26 to 30 teams. Bob Naegele, Jr. became the lead investor for an application to the NHL for an expansion franchise, on June 25,1997, the NHL announced that Minnesota had been awarded an expansion franchise, to begin play in the 2000–01 season. The six finalist team names for the new NHL franchise, were announced on November 20,1997. Jac Sperling was named Chief Executive Officer of the Minnesota team, Doug Risebrough was named General Manager, Tod Leiweke was named President, the team was officially named the Wild, with the unveiling occurring at Aldrich Arena in the suburb of Maplewood on January 22,1998. The new name was introduced to everyone with the song Born to be Wild by Steppenwolf playing over the speaker system. The Minnesota Wild announced its first major agreement with MasterCard from First USA. It was the earliest that First USA had ever signed an agreement in advance of a team beginning play. The Western Hockey League is a major junior ice hockey league based in Western Canada and the Northwestern United States. The WHL is one of three leagues that constitute the Canadian Hockey League as the highest level of hockey in Canada. 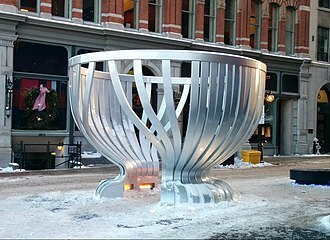 Teams play for the Ed Chynoweth Cup, with the moving on to play for the Memorial Cup. WHL teams have won the Memorial Cup 19 times since the league became eligible to compete for the trophy, the league was founded in 1966, as the Canadian Major Junior Hockey League, with seven western Canadian teams in Saskatchewan and Alberta. From 1967, the league was renamed the Western Canadian Hockey League, the league was the brainchild of Bill Hunter, who intended to build a western league capable of competing with the top leagues in Ontario and Quebec. Originally considered an outlaw league by the Canadian Amateur Hockey Association, the WHL comprises 22 teams, divided into two conferences of two divisions. Despite winning the 1966 Memorial Cup, the Edmonton Oil Kings owner, each of the Wests four provinces had its own junior league, and Hunter felt that this put them at a disadvantage when competing nationally against the powerful leagues in Ontario and Quebec. Desiring stronger competition, Hunters Oil Kings competed in the Alberta Senior Hockey League rather than the Alberta Junior Hockey League, despite concerns that this new league would see the demise of the Alberta and Saskatchewan leagues, the governing bodies in both provinces sanctioned the new league. The CAHA did not, declaring the CMJHL to be a league and suspending all teams. The new league accused the CAHA of overstepping its boundaries and with the support of the players and their families, the CMJHL renamed itself the Western Canada Hockey League in 1967, adding four new teams to total 11 as the league stretched east into Manitoba. Concerns over the WCHLs relationship with the CAHA led the Pats and Red Wings to withdraw before the 1968–69 season, the first decade of the WCHL saw constant expansion and franchise movement as the league spread throughout the West. The Flin Flon Bombers became the leagues first powerhouse team, led by future NHL stars Bobby Clarke, the Brandon Wheat Kings and Swift Current Broncos joined in 1967, the Medicine Hat Tigers in 1970. In ice hockey, the goaltender is the player responsible for preventing the hockey puck from entering their teams net, thus preventing the opposing team from scoring. The goaltender usually plays in or near the area in front of the net called the goal crease, goaltenders tend to stay at or beyond the top of the crease to cut down on the angle of shots. In todays age of goaltending there are two styles and hybrid. Because of the power of shots, the goaltender wears special equipment designed to protect the body from direct impact, the goalie is one of the most valuable players on the ice, as their performance can greatly change the outcome or score of the game. One-on-one situations, such as breakaways and shootouts, have the tendency to highlight a goaltenders pure skill, only one goaltender is allowed to be on the ice for each team at any given time. The goaltender is known as the goalie, goalkeeper, net minder, in the early days of the sport, the term was spelled with a hyphen as goal-tender. The art of playing the position is called goaltending and there are coaches, the variation goalie is typically used for items associated with the position, such as goalie stick and goalie pads. Goaltending is a position in ice hockey, at higher levels in the game, no goalies play other positions. A typical ice hockey team may have two or three goaltenders on its roster, the NHL requires each team have a list of emergency goalies. The list provides goalie options for both the home and visiting teams and these goalies are to be called to a game if a team does not have two goalies to start the game. An emergency goalie may be called if both roster goalies are injured in the same game, Jennings Trophy for fewest goals allowed. Martin Brodeur was the first goaltender in the National Hockey League to score a game-winning goal, the goaltender has special privileges and training that other players do not. He or she wears special goaltending equipment that is different from that worn by players and is subject to specific regulations. Richard David Nifty Middleton is a Canadian former professional ice hockey player for the New York Rangers and Boston Bruins of the National Hockey League. He spent the 1973–74 season with the Rangers farm team, the AHL Providence Reds, earning rookie of the year honors and he made the big club during the 1974–75 season, and despite suffering injuries that restricted him to 47 games, scored 22 goals in that limited time. The following season was not as spectacular, as he scored 24 goals in 77 games while showing defensive deficiencies, Middleton was traded to the Boston Bruins for Ken Hodge on May 26,1976. Rangers head coach and general manager John Ferguson Sr. was confident that his team had enough talent to justify making Middleton expendable. What the Bruins got was a player who was ten years younger, the transaction became even more one-sided in favor of the Bruins when head coach Don Cherry developed Middletons defensive skills to make him a solid two-way player. Generally paired with centre Barry Pederson, Middleton had five seasons of at least forty goals and ninety points. His leadership was apparent in being named co-captain to succeed Terry OReilly in 1985, regarded as one of the best one on one players of all time and currently ranks #2 all time in career shooting percentage among players with 400+ goals. His 105 points in the 1983–84 season tied Ken Hodges team record for most points scored in a season by a right winger, Middleton starred in international play, being named to play for Team Canada in the Canada Cup in 1981 and 1984. Teamed on a line with Wayne Gretzky and Michel Goulet in the 1984 series, he scored four goals, Middleton played in the NHL All-Star Game in 1981,1982 and 1984. Although he wore a helmet thereafter and recovered enough to score 31 goals the following year, he had recurring headaches for the rest of his career and he retired with 448 goals and 540 assists for 988 points in 1005 games, and added 100 points in 114 playoff games. He is currently the President of Boston Bruins Alumni and a partner in Orlanda Energy Systems, Rick recently joined forces with New England High School Sports Showcases and will run high school hockey showcases beginning in June 2014. 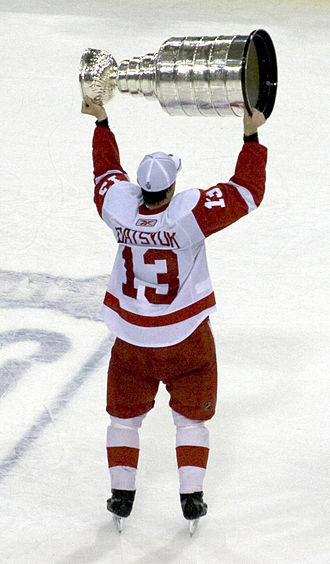 Lidström in 2006, during his first season as captain of the Red Wings. Lidström at Mellon Arena in 2010. 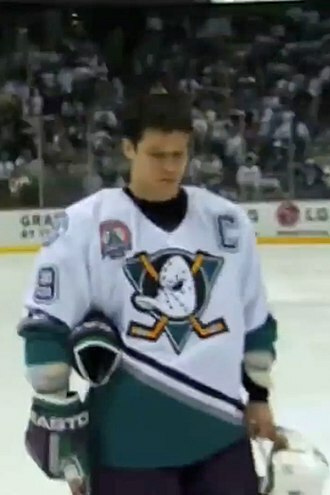 Paul Kariya was the Mighty Ducks' captain from 1996 to 2003, and led the team to the 2003 Stanley Cup Finals. Scott Niedermayer battles for the puck with San Jose Sharks' Scott Hannan in a game during the 2005–06 season. Signed in the 2005 off-season, he was later named as team captain. Chris Pronger during the 2006–07 season. 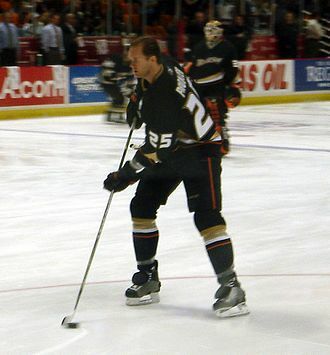 The Ducks acquired Pronger during the 2006 off-season, in a trade with the Edmonton Oilers. U.S. President George W. Bush is presented with a Ducks jersey during a White House ceremony in honor of the team's championship season. 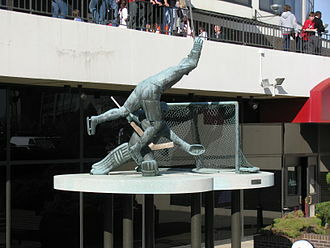 Eagle sculpture featuring Stan Smyl, who was captain for eight seasons. A statue of coach Roger Neilson outside of Rogers Arena, commemorating the 1982 Stanley Cup run. Kirk McLean was a key member of the Canucks' 1994 Stanley Cup run. The Vancouver Canucks and the Edmonton Oilers warm up before a match at the new General Motors Place, October 1997. On June 19, 2000, the Minnesota Wild named Jacques Lemaire as their first-ever head coach. Marian Gaborik waves to the crowd after a five-goal performance against the New York Rangers in the 2007–08 season. The Wild faced the Carolina Hurricanes at Hartwall Areena in Helsinki to open the 2010–11 season. Josh Harding led the NHL in save percentage and goals against average before succumbing to injuries during the 2013–14 regular season. 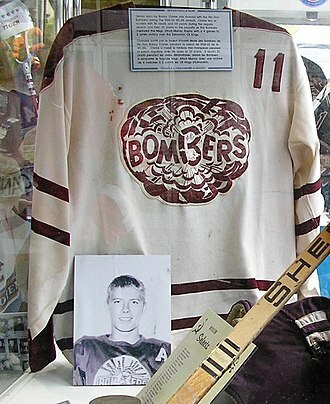 Bobby Clarke's Bombers jersey on display at the 2007 Memorial Cup in Vancouver. Clarke prepares for the ceremonial puck drop with Bobby Orr prior to the 2010 NHL Winter Classic. Tortorella as head coach of the New York Rangers during a game in March 2009. He was named the Rangers' head coach on February 23, 2009. As the Vancouver Canucks head coach, Tortorella sparked controversy starting Eddie Lack (left) over Roberto Luongo (right) in the 2014 Heritage Classic. The Aréna Raymond-Bourque in Saint-Laurent, QC. With the Stanley Cup present (l), US President George W. Bush receives a commemorative jersey and mini-Cup from 2002 Stanley Cup Champion Steve Yzerman. McDonald and his grandson help conduct the ceremonial faceoff at the Heritage Classic.